You need two components. Firstly, you need a GPS receiver to receive the satellite signal. This simply plugs into a socket in the PC in your car. You also need software to convert the satellite signals to more meaningful information and show the position on a map on the display screen. Various types of GPS mouse, as this is normally known, are available. Most manufacturers offer a mouse with a serial, USB, or bluetooth interface. I recommend you choose a USB model. This will still use the serial protocol, but will have a software serial emulator supplied to allow you to plug into a USB port. At some point, you may want to use your GPS mouse along with a laptop or handheld PC, and it is very rare to find a serial port on modern laptops. A GPS mouse gives you the best portable GPS solution for flexibility. It is essential to check the GPS mouse has an NMEA interface (National Marine Electronics Association). Although this interface is an industry standard, some manufacturers also offer models with their own proprietory interface, which may not work with all GPS software. If you are using a front end such as Centrafuse, then your car GPS software needs are already taken care of. The navigation version of Centrafuse has Sat Nav software included in the package. If you're working to a tight budget, there is some free GPS software available. In my opinion, GPSS is the pick of the bunch and it costs you nothing to give it a try. The maps are limited however, and if you want more detail, you will have to source your own more detailed maps. See how SatNav maps are made. Trilateration. 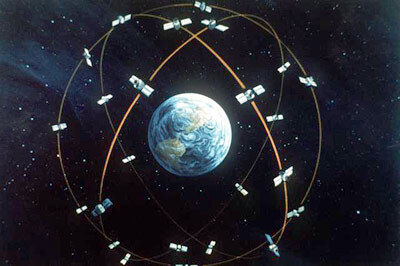 The principle behind the calculation of GPS map co-ordinates.